The United States Fish and Wildlife Service honored the University of Missouri College of Veterinary Medicine Raptor Rehabilitation Project Tuesday, July 17, for its contributions to the well-being of migratory birds. 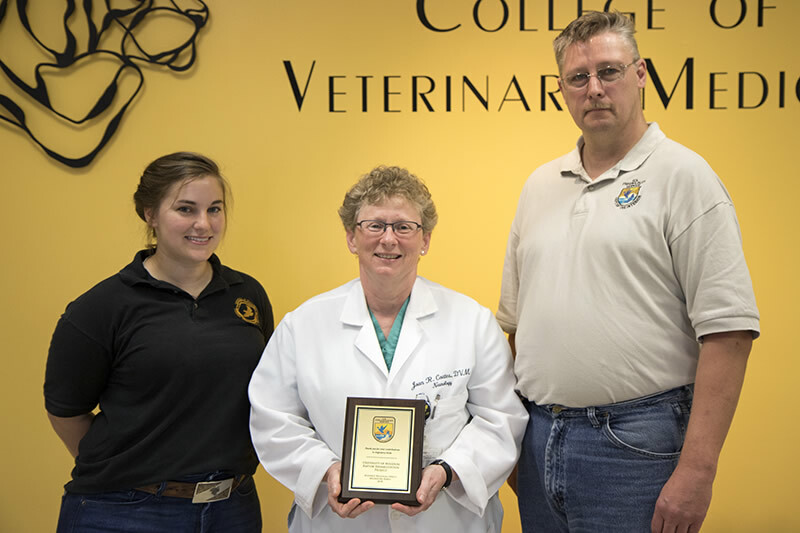 Rick Rottman of the federal agency visited the MU College of Veterinary Medicine to present a plaque to project representatives and thank them for their partnership with U.S. Fish and Wildlife. 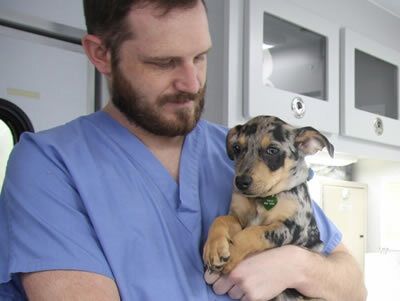 While in Columbia, he toured the project’s CVM facilities. Rick Rottman of the United States Fish and Wildlife Service presents a plaque to (center) CVM Professor of Veterinary Neurology and Neurosurgery Joan R. Coates, DVM, MS, DACVIM, who serves as the faculty advisor to the Raptor Rehabilitation Project, and Raptor Rehabilitation Project Coordinator Abigail Rainwater to recognize the project’s contributions to migratory birds. The Raptor Rehabilitation Project was started in 1973 as a service and education organization of the CVM. The primary goal of the project is to heal injured raptors and release them back into the wild. Veterinary and other MU students, along with members of the community, volunteer their time and effort to rehabilitate injured raptors and care for the project’s resident birds. Raptors that are brought to the MU Veterinary Health Center have usually been injured by flying into objects like cars, buildings or fences. Other common injuries include gunshot wounds, eye wounds, and complications resulting from habitat loss. Upon hospitalization, the bird’s injuries are assessed. Necessary medical procedures, including surgeries, are performed. The birds then recover in large flight cages. During this time, the birds are monitored in an attempt to bring them to a releasable state. Before being released, the birds must be able to hunt for themselves. This requires keen sight, strong flight and the ability to recognize and capture prey. When birds are fully recovered and have reached a releasable state, they are set free. Project volunteers work with Department of Conservation agents to safely release the raptors. The goal is usually to return them to the area where they were originally found. If a bird’s injuries prevent it from being returned to the wild, the project finds a sanctuary to take it in, or some birds become part of the project’s resident colony. Some resident birds become part of the project’s public awareness program and are taken to presentations throughout central Missouri to teach the general public about the ecological and cultural importance of birds of prey.